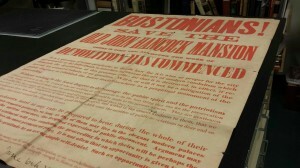 Courtesy of R. Stanton Avery Special Collections, NEHGS. I will be out of the office today, attending a planning meeting for the New England Regional Fellowship Consortium (NERFC) at the John Hay Library in Providence. The New England Historic Genealogical Society (NEHGS) is a member of the consortium, a group made up of New England state and local historical societies, university and college libraries (Harvard, Smith, Trinity, and Brown), and museums (Historic Deerfield and Mystic Seaport). What links the membership together, for the purpose of providing $5,000 research fellowships, is a shared interest in making their large collections available for use by historical researchers. Today’s meeting is concerned with planning for choosing the 2015–2016 NERFC Fellows. We will tour the John Hay Library at Brown: this is a feature of NERFC meetings, as it is always interesting to see the facilities and layout of the other member institutions. The consortium members will then meet to choose officers for the coming year and prepare for our March meeting. During the winter, we will review completed applications from (judging by previous years) about 80 applicants, and in March we will choose fifteen Fellows for research grants. The Colonial Society of Massachusetts, one of the consortium members, offers a special grant at the beginning of the March meeting, after which the NERFC representatives from Baker Library, Boston Athenaeum, Boston Public Library Rare Books [which is currently closed for inventory; it reopens in late 2019], Colonial Society of Massachusetts, Congregational Library and Archives, Connecticut Historical Society, Francis A. Countway Library of Medicine, Harvard Law School Special Collections, John Hay Library, Historic Deerfield, Houghton Library, Maine Historical Society, Massachusetts Historical Society, Mystic Seaport, NEHGS, New Hampshire Historical Society, Rhode Island Historical Society, Schlesinger Library, Sophia Smith Collection, [and] Vermont Historical Society … will vote to choose the other grant recipients. All NERFC Fellows visit at least three of the member organizations. The 2014–2015 grant recipients are writing about topics ranging from the seventeenth to the twenty-first centuries, from an “invisible throat distemper” epidemic of the 1730s to an “antebellum confrontation with history,” from “The Invention of Rum” to “The Experience and Meaning of Tuberculosis in Rural New England, 1800–1850.” I urge all Vita Brevis readers who are enrolled in doctoral programs or preparing historical research projects for publication, and with a focus on New England, to consider applying for one of the 2015–2016 New England Regional Fellowship Consortium grants. Scott, are any of these completed papers available? Thanks, Scott. I’ll save this to “VB-Grants” this time rather than to “VB-General”! Will review an application for next cycle. Holding archive has long history of publication itself so that old-fashioned way is what I am considering, but straight to DB off of excel/spss might be easier to get it “published” and so more readily used. But I can only propose as they “own” the material.